Artisan teas from ancient “Tra Thuyet Shan” (“Snow High Mountain”) tea trees in Vietnam, characterized by particularly high quality processing and outstanding picking standard – arguably the best teas in the world. All 8 Ancient Snow Shan teas in one box! 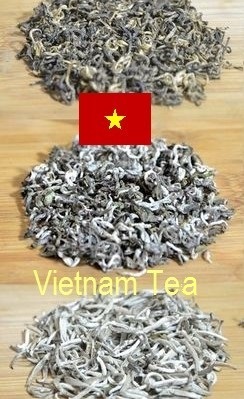 To try all teas from our line of North Vietnamese Arbor teas at Siam Tea Shop, or just for your enjoyment! That is, either 10g or 25g of each of the following Tuyet Shan / Ancient Snow Shan teas in the SiamTeas box: Ancient Snow Shan Green Tea, Ancient Snow Shan Black Tea, Ancient Snow Shan Silver Needle White Tea, Ancient Snow Shan Tra Pai Hao, Ancient Snow Shan Shou „1+2“, Ancient Snow Shan Sheng „1+1“, Ancient Snow Shan Sheng „1+2“, Ancient Snow Shan Sheng „Big Leaves“. For more information and illustrations refer to the product description below. Ancient Snow Shan Big Leaves Sheng Pu Erh Tea is an unripened “hei cha” from ancient tea trees in Vietnam’s northernmost province, Ha Giang, with big leaves picking standard. Accordingly, pronounced earthy and mineral notes dominate this tea’s taste. However, soon after hitting the taste buds, the liquor will provoque an intense, long lingering sweetness. Ultimately, the overall taste impression reflects the essence of the land and sky under which the tea trees thrive. As is characteristic for teas from our producer partner in Ha Giang, the processing of their pu erh teas is rooted in ancient local artisan traditions. Handpicked black tea from 100+ years old “Thuyet Shan” (= “Snow High Mountain”) tea trees in Ha Giang province, Vietnam. Our producer partner in Vietnam picks this tea from March to midst of May and from September to November every year with a picking standard of 1+2 from the tea trees of their biodiverse and health and environment-friendly operated plantation, located at altitudes of 1400+ meters. Until today, a large part of the processing is done manually and in form of a true “artisan process”. Ancient Artisan Snow Shan Green Tea – handpicked from 100+ years old “Thuyet Shan” (= “Snow High Mountain”) tea trees in Ha Giang province, Vietnam. Our producer partner in Vietnam picks this tea every year in spring with a picking standard of 1+1 from the tea trees of their biodiverse and health and environment-friendlyally operated tea plantation. Even today, large parts of the processing are done manually, forming a true “artisan process”. Ancient Snow Shan Sheng Pu Erh Tee 1+1 is a unripened “hei cha” from ancient tea trees in Vietnam’s northernmost province, Ha Giang. Only the young buds, each with one leaf attached, are picked for this tea – of course, by hand. Like all teas of our producer partner in Ha Giang, the processing of their pu erh teas is rooted in ancient local artisan traditions. This, along with a genuine passion for producing tea, leads to a level of processing excellence that is about unprecedented in the industry. Ancient Snow Shan Sheng Pu Erh Tee 1+2 is a unripened “hei cha” from ancient tea trees in Vietnam’s northernmost province, Ha Giang. Only the young buds, each with two leaves attached to it, are picked for this tea – of course, by hand. Like all teas from our producer partner in Ha Giang, the processing of their pu erh teas is rooted in ancient local artisan traditions. This, along with a genuine passion for producing tea, leads to a level of picking and processing excellence that is about unprecedented in the industry. Ancient Artisan Snow Shan Tra Pai Hao Tea is a Vietnamese black tea specialty yielded from leaves of the ancient “Thuyet Shan” (= “Snow High Mountain”) tea trees. The Thuyet Shan tea tree is native the central Vietnamese province of Ha Giang. There, at altitudes of 1400+ meters, the biodiverse and health and environment-friendly operated tea plantation of our producer partner for Vietnamese Snow Shan teas is located. The “arguably best teas in the world” convince with meticulously realized picking standard (here: 1+1) and highly diligent processing. Tra Pai Hao Black Tea combines the deep sweetness, cocoa notes and malty character of black Yunnan tea with the benefits of unparalleled quality processing and the special features of the Thuyet Shan tea tree. Ancient Snow Shan White Silver Needle Tea (pure buds, spring picking) from ancient Thuyet Shan (“Snow High Mountain”) tea trees in Vietnam. Ancient Snow Shan White silver needle tea (pure buds, spring picking) from ancient Thuyet Shan (“Snow High Mountain”) tea trees in Vietnam. Our local producer partner’s tea plantation, located at altitudes of 1400+ meters in Ha Giang province, is operated according to biodiverse and health and environment-friendly cultivation principles. All Snow Shan teas are excelling both in picking and processing standards.